Apple is widely rumored to launch a high-end iPhone with an edge-to-edge OLED display this year, which has been variously called the "iPhone 8" or "iPhone X" to commemorate the smartphone's tenth anniversary, and rumors suggest the device will an include iris scanner to authenticate with your eyes. 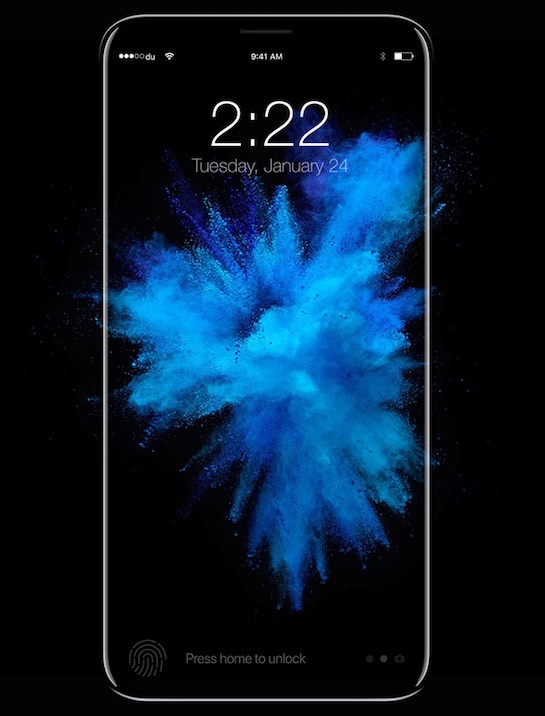 Taiwanese website DigiTimes, citing unnamed "industry sources," claims the so-called "iPhone 8" will include an OLED display, wireless charging, and iris scanning technology, the latter of which would presumably enable iPhone users to unlock their device or use Apple Pay by authenticating with their eyes. A person's iris, or the circular colored muscle of the eye, contains a complex and random pattern that is unique to each individual. DigiTimes has sources within Apple's supply chain, but it has a mixed track record at reporting on Apple's unannounced product plans, so this latest report should be treated with a proverbial grain of salt. The publication previously said iPhones with iris scanning capabilities would not debut until 2018. DigiTimes previously cited a Chinese website that said 2017 iPhones will include iris scanning capabilities, but today's report is based on its own sources. The original report claimed Taiwan-based supplier Xintec, an affiliate of Apple manufacturer TSMC, would begin mass production of iris-recognition chips this year. KGI Securities analyst Ming-Chi Kuo, one of the more reliable sources of iPhone rumors, believes Apple is leaning toward facial recognition technology rather than iris recognition, based on the bio-recognition patents it has filed. Way back in March 2016, he said the "iPhone 8" will include either facial or iris recognition. Kuo said he believes Touch ID will "ultimately be replaced by a facial recognition system" for enhanced security, in line with rumors Apple will remove the Home button; however, if the technical challenges cannot be overcome, he noted a "combination of fingerprint and facial recognition" is another possible solution. Last month, Cowen and Company analyst Timothy Arcuri said the "iPhone 8" could include facial or gesture recognition technology powered by a laser sensor and an infrared sensor located near the front-facing camera. The feature could allow users to control their devices with simple gestures for tasks such as adjusting volume. Lending credence to these rumors is Apple's trademark for "Iris Engine" and the acquisitions of companies such as Faceshift and PrimeSense. iPhone would not be the first smartphone with an iris scanner, as Samsung included the technology on its now-discontinued Galaxy Note7. DigiTimes also said the "iPhone 8" will enter production earlier than in previous years, in line with a report from earlier this week. Apple's trio of new iPhones, including more iterative "iPhone 7s" and "iPhone 7s Plus" models, are still expected to launch in September per usual. The "iPhone 8" in particular may cost upwards of $1,000 in the U.S. due to its significant redesign and features that require more expensive parts. a fingerprint is much more practical unless the iris scanner is some kind of amazing new accurate technology. who wants to bring their phone right up to their eyes? Waste of money, time and resources. By the time I get my phone out of the pocket, it's already unlocked. No need to look at it at all. So we will have the first true EyePhone? Seems like fingerprint is the way to go in this area, but I can see it being a cool factor for the phone even though I question how well a first gen phone would do at this. If Apple do it, they will make it so that it works properly. This is always one of those rumors that I hope ends up being false. I think it sounds so hokey and gimmicky to try and pick up the phone straight in front of me and have it try to scan my face or my eyes every time I want to unlock it. Just tapping my finger on the screen is instantly faster and more reliable. When I had my note 7..it did work with glasses...do some research first ..
You could have just answered the very legitimate question without being childish. This is just a waste of technical resources. Apple should go back to the drawing board and make buy worthy computers.